Dead Men... TELL NO TALES! Join the TellNoTales mailing list to keep abreast of the latest Pirates news! Just enter your email address below... savvy? Escaping the eerie grotto, the boats find themselves thrust through a blinding mist into the smoky middle of a battle. Pirates aboard their ship, "The Wicked Wench," are lobbing cannonballs across the lagoon at a spanish fort, which is returning fire. Caught in the middle between splashing cannonballs are the innocent guests aboard their boats, proceeding heedlessly through the smoky melee. The audio soundtrack from the battle portrays the evil pirates aboard the "Wicked Wench" preparing to sack an unsuspecting Caribbean town. With each splash of each apparent errant cannonball, the water glows orange as the red hot projectile cools. At left: a rare photo of one of the Wicked Wench's crew preparing to fire a cannon at the fort. 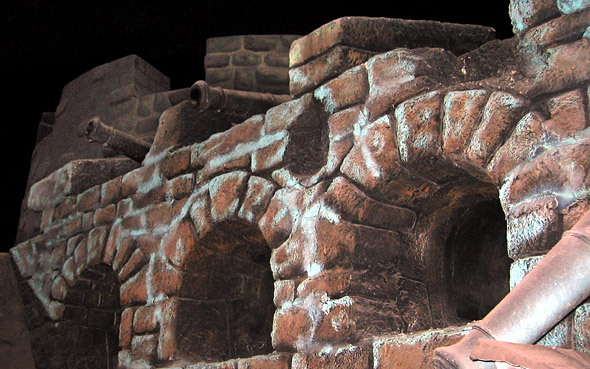 The audio-animatronic character moves up and down to peek out from behind the ship, and the cannon moves forward and backward with the force of the "blast." Of course, there are no real projectiles. Each cannonball splashdown is actually created by a flash of light mixed with an upward blast of air from under the water surface. 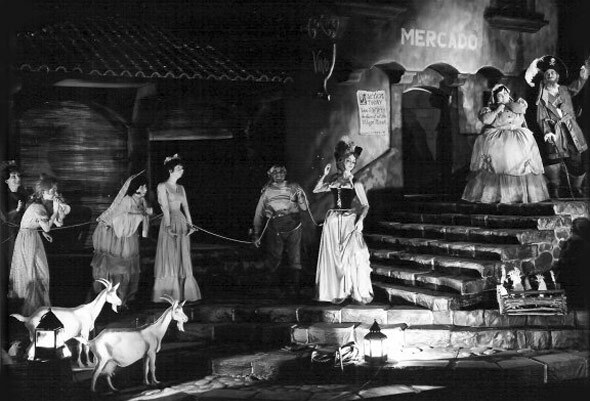 This set is one of the most majestic large-scale scenes in the ride, but even so, it uses lighting and forced perspective to create the appearance of a much larger space. By creating a ship with top sails that are much smaller than they would be on a real ship (and, likewise, a fortress with smaller upper levels), the effect of a larger scale is created. As part of Disneyland's 50th anniversary enhancements in 2005, the cannon fire and resulting blasts were amped up, with much larger splashes and blasts from an air cannon whooshing through guests' hair. Pictured below: the fort upon which the pirates are firing their cannons. Carlos, the town's magistrate, is tortured by the pirates who are seeking the spoils of their raid by attempting to steal the town's riches. Passing through the gates of the sacked town, guests see the first of a number of incredibly detailed scenes of mayhem. First, Carlos, the magistrate of the town is seen being tortured by being dunked in the town well by a group of pirates asking for the location of the treasure. "I weel not talk!" he replies bravely in a Spanish accent, before being dunked yet again. A line of other town officials stand in a line, bound as prisoners, perhaps waiting their turn at being questioned. 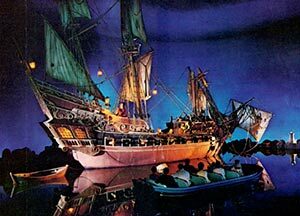 Floating on, the next scene that guests come to is the ride's infamous "auction scene," in which drunken pirates are encouraged to bid on the local women, and a banner advises the men to "Take a Wench for a Bride!" 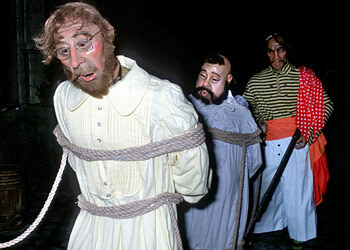 In an interview with "E Ticket" Magazine, Imagineer Claude Coats recalls Walt's apprehension at the idea of the scene. "He came in one time and even said, 'This will be all right, won't it?' He was a little doubtful of auctioning off the girls. Was that quite 'Disney' or not?" Pirates will be pirates, though, so the scene was included... though some humor was added to the scene, to give it a comic lift. While the auctioneer (pictured, right) is trying to sell off one on the typical "stout-hearted and cornfed" women of the town, the bidders cry out for the "redhead," a flirtatious woman waiting in the wings for her turn to go to the highest bidder, with apparent delight. An audio loop from the Auction scene demonstrates more of "X" Atencio's great script and deft sense of humor. The auctioneer: "Do I hear Six? Who'll make it six? 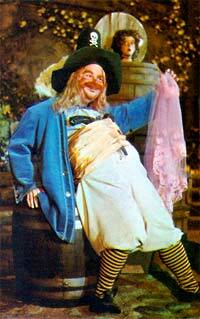 The drunken bidder: "Six it be... Six bottles of rum!" The auctioneer: "I'm not spongin' for rum! It be gold I'm after..."
Pictured above: Some of the pirates take a break to enjoy a bit of rum. 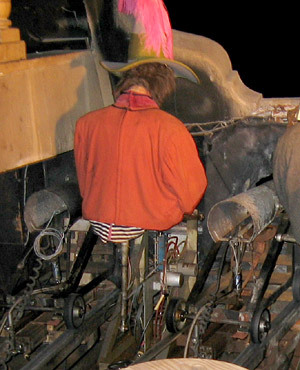 Pictured during a ride rehab, the audio-animatronic figures above can be seen without their costumes. Drifting onward, we see that many of the women of the town didn't take kindly to being sold off, as many of them have apparently escaped, and are being chased through town by their pirate suitors. 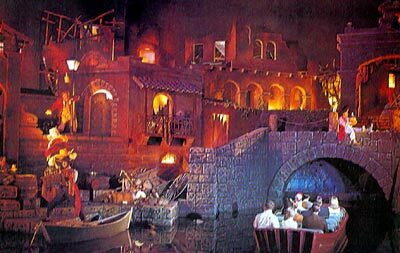 This scene (accomplished by placing the frozen "chasing" characters on rapidly spinning carousels) has since been removed, and now features pirates chasing after food. One infamous tableau from this scene featured a "pooped" pirate reminiscing about the "lively lassie" he wished to "hoist his colors" upon. Holding her slip as he prattles on, the innocent victim peers out from inside an oak barrel behind the pirate's back as he keeps boasting, unaware. Judging this scene to be a bit over the top in today's social climate, Disney changed the scene. An audio loop of the '90s era "pooped pirate" demonstrates his less-controversial intentions, as he hunts food, rather than lively lassies. Though the setting is the same, the scenewas altered to feature the "pooped" pirate reminiscing about the culinary wonders of the town, as hunger seems to have taken the place of a lusty libdo in these pirates' minds. Rather than a frightened maiden peeking out of the barrel, now an alley cat would peek out, trying to steal a meal off of the gluttonous pirate's platter. 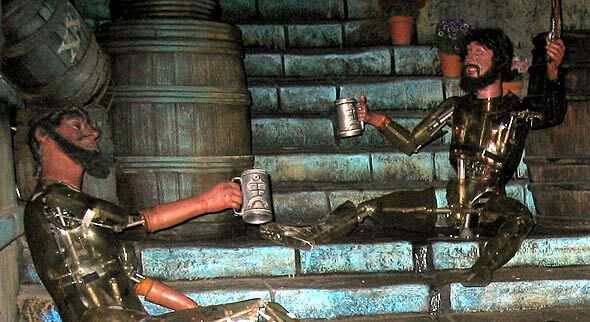 With the 2005 rehab of the attraction, pirate Jack Sparrow from the film franchise was added to the attraction in three scenes: once near the magistrate-dunking sequence, once at the very end of the ride, and once right here, again altering the "pooped pirate" scene. 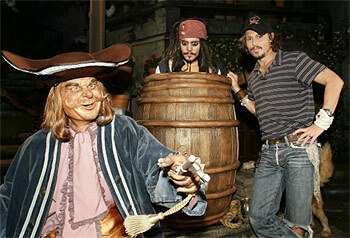 Now, Sparrow hides in the barrel, peeking out as he tries to discover where the town's loot is hidden. An audio loop of the drunken arsonists as they hoist their torches in the air and set the town ablaze. 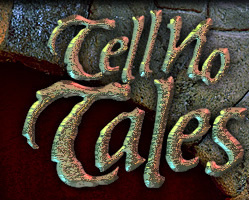 Click here to advertise on TellNoTales.com! 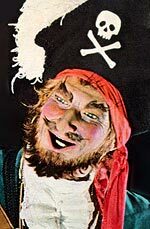 All Pirates of the Caribbean and/or Disney images, sounds, and media copyright © Disney. Website ©2003-2007 by Chef Mayhem. This site is NOT affiliated in any way with the Walt Disney Company, and no rights of usage are implied. This is a site created by and for Disney fans solely to celebrate Disney theme parks.